Overnight Oats is recently very popular among fitness junkies. Dairy products have been a favourite in many parts of the world – and for very good reasons too. For example, a glass of milk can provide the nutrients and energy needed to sustain you throughout the day. Recently, Fonterra Brands Malaysia shared ways for Muslims to incorporate dairy into their diets. Fonterra consultant dietician Nurul Aziah Musa said the fasting month is a good time for people to refocus their attention on nutrition, and be more aware of the foods they are putting in their bodies to support long-term health and wellness. “Meal planning is exceptionally important for those going on the fast. To sustain energy levels and stay hydrated throughout the day, you need to get a balanced diet of nutrient-rich foods and fluids,” Nurul Aziah said. Together with Nurul Aziah, Fonterra cooperative affairs manager and chairman of the halal committee Manisya Ismail shared recipes for sahur and iftar at a culinary demonstration using the range of Fonterra dairy – including milk, butter and yoghurt from Anlene, Anchor, Fernleaf and CalciYum. 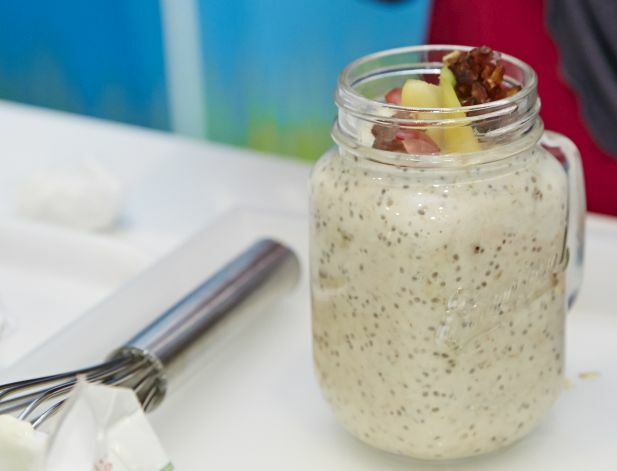 This Overnight Oats is recently very popular among fitness junkies and this recipe is highly nutritious with plenty of fibre to help you sustain yourself throughout the day during and after the fasting month. This recipe and photo are courtesy of Fonterra Brands Malaysia. Whisk together all ingredients in a jar. Seal with a lid. Keep in fridge until it becomes thick like pudding, preferably overnight. Garnish the oats with dates or fresh fruits of your choice, granola or coconut flakes as desired. Best served chilled.